REKS – Newport, RI | 10.6.17 | rhymeCulture.org | culture. music. news. 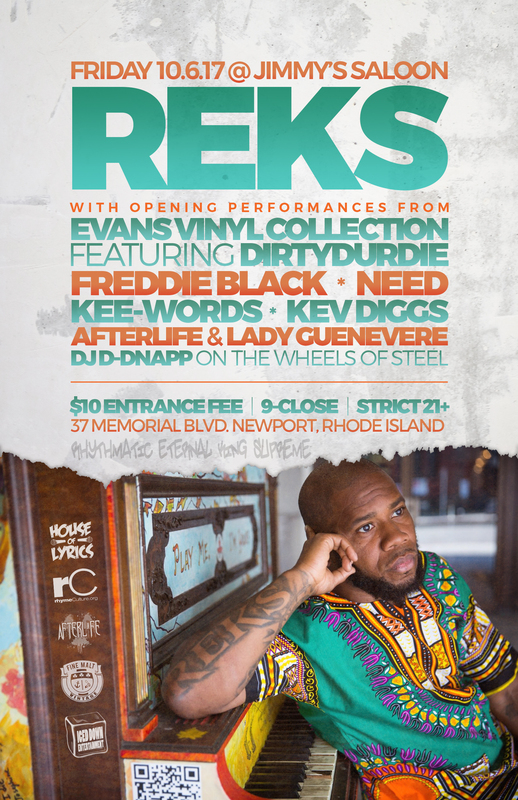 Hip Hop legend REKS returns to Newport, RI on Friday 10/6/17! He’ll be appearing at Jimmy’s Saloon with Evans Vinyl Collection feat. DirtyDurdie, Freddie Black,NEED, Kee-Words, KEVdiggs, AfterLife & Lady Guenevere and DJ D-Napp! Brought to you by House of Lyrics, RhymeCulture, AfterLife, Fine Malt Vintage & Iced Down Entertainment. Corey Isiah Christie (born August 24, 1977), better known as REKS, is an American rapper. REKS emerged from Lawrence, Massachusetts’ underground rap scene. REKS was a breakdancer in his teens and was part of a local B-boy crew called Funk Town Connection. By the time he entered college at University of Massachusetts Amherst, REKS had built a reputation for himself in the local Boston rap scene, but then eventually quit school to begin recording for Brick Records. A few 12″ singles, “I Could Have Done More” and “Fearless,” arrived first in early 2001, before Brick issued his debut LP, Along Came the Chosen, later that year. This earned him nominations for Hip-Hop Album and Artist of the Year by the Boston Music Awards. REKS worked with DJ Premier, Styles P, Alchemist, Hi-Tek, and many others on his 2011 album Rhythmatic Eternal King Supreme.